The Borough of Chambersburg is developing a Curb and Sidewalk Installation Program to identify where curb and sidewalk networks are necessary Borough-wide and to determine whether existing policies regarding curb and sidewalk installation and financing should be changed. In 2018 property owners, and the general public, were provided opportunities to review and comment on the draft maps and policies through a series of public meetings, website, and Borough staff interaction with property owners. In July 2018 staff provided to the Curb and Sidewalk Policy Compliance Committee a report of public comments received as well as recommendations for further program development. In October 2018 the Curb and Sidewalk Policy Compliance Committee discussed changes to the policies regarding curb and sidewalk installation and financing; and, decided to discuss changes to the draft maps starting in January 2019. In January 2019 the Committee reviewed draft maps for the First Ward, Second Ward and Fourth Ward and made recommendations regarding how the maps should address curbs and sidewalks. On Thursday, April 18, 2019 the Committee will review draft maps for the Third Ward and Fifth Ward and make recommendations regarding how the maps should address curbs and sidewalks. To determine where your property is located please refer to the attached map highlighting in yellow the Third Ward and Fifth Ward. The Committee meeting will be held at 7:00 p.m. in Council Chambers on the first floor of the Utility Departments Addition to Borough Hall, 100 South Second Street. Public comments from those that attend the meeting will be considered by the Committee before making any final recommendations to Town Council about the Curb and Sidewalk Installation Program; however, it is up to Council to make final decisions regarding the program, including the policies and maps. Only once the Committee makes a recommendation on the Curb and Sidewalk Installation Program, will Town Council take up final approval, at a future public meeting. Please contact Phil Wolgemuth, Assistant to the Borough Manager, at pwolgemuth@chambersburgpa.gov or 717-251-2436 with questions or comments about the Curb and Sidewalk Installation Program. Curb, Installed/Required – Not to be removed and to be maintained indefinitely. Curb, Not Installed/Planned – To be installed in future. Curb, Not Installed/Not Required – Not to be installed in future. Curb, Installed/Optional – Can be removed in future. Sidewalk, Installed/Required – Not to be removed and to be maintained indefinitely. Sidewalk, Not Installed/Planned – To be installed in future. Sidewalk, Not Installed/Not Required – Not to be installed in future. Sidewalk, Installed/Optional – Can be removed in future. Path, Installed/Required – Not to be removed and to be maintained indefinitely. Path, Not Installed/Planned – To be installed in future. Chambersburg Curb and Sidewalk Installation Program – Approved by Town Council on January 22, 2018. On Thursday, October 19, 2017, the Curb and Sidewalk Policy Compliance Committee recommended the Curb and Sidewalk Installation Program to Town Council. The program includes a map of every tax parcel in the Borough of Chambersburg and indicates whether the program anticipates, or not, the construction of curbs and/or sidewalks. This program is currently a DRAFT and has not yet been approved by​ Town Council. It may be changed before adoption and any current or​ future Town Council may amend it after adoption. What is the Curb and Sidewalk Installation Program? It’s a holistic look at curb and sidewalk improvements in the Borough​ of Chambersburg and will likely be approved as an appendix to the next​ Comprehensive Plan Update; as authorized by law under the Pennsylvania​ Municipalities Planning Code. Will there be public meetings/public hearings before this program is adopted? Yes, there will be a series of neighborhood meetings scheduled in 2018​ to review the draft program before the current Town Council takes any​ action. Further, adoption of the program and associated maps, and any​ future changes to the adopted program and maps, would require an​ advertised public hearing and public input before a vote. Who else will review the Curb and Sidewalk Installation Program prior​ to adoption? Prior to adoption, the Curb and Sidewalk Installation Program will be​ reviewed and recommended by the Curb and Sidewalk Policy Compliance​ Committee, a group of volunteers appointed by Town Council to provide​ advice and guidance on policy decisions; and it will be reviewed by​ the Franklin County Planning Commission, the Franklin County Municipal​ Planning Organization and any interested community organization. Is the Curb and Sidewalk Installation Program set for good? No, per the Pennsylvania Municipalities Planning Code, the Borough can​ amend, change, add or delete items on the Curb and Sidewalk​ Installation Program following a specific public hearing process. That​ process always begins with a review of possible program and map​ changes by the Curb and Sidewalk Policy Compliance Committee. The Borough of Chambersburg requires property owners to maintain curbs and sidewalks along their property frontages on public streets. For example, in addition to clearing snow and ice from sidewalks, property owners must keep sidewalks and curbs in good repair, safe condition and free of vegetation or other obstructions. Maintenance standards are enforced by the Borough on a complaint basis or when a street is scheduled for reconstruction, at which time property owners are notified that curb and/or sidewalk repairs are necessary. Properties in the Borough without curbs and sidewalks are required to install those improvements in several ways. Land being developed with new residential, commercial or manufacturing uses is in most instances required to install curbs and sidewalks as part of the approved land development plan. Land that is already developed, but lacks curbs and/or sidewalks, is required to install those improvements when adjacent public streets are scheduled for reconstruction. Also, in certain instances, curb and sidewalk installation is required even when a street is not scheduled for reconstruction. The noted curb and sidewalk maintenance and installation standards are authorized by state and local laws that also permit the Borough to hold property owners accountable for associated costs. As such, the Borough does not pay for curb and sidewalk maintenance or installation on private property but rather requires property owners to pay those costs. Borough policy decisions regarding curbs and sidewalks are made by the elected 10- member Town Council with advice from the Curb and Sidewalk Policy Compliance Committee, which is comprised of volunteers appointed by Council. While the Committee reviews matters associated with curbs and sidewalks, and makes policy and installation recommendations to Council, it is ultimately up to Council to make final decisions regarding policies and whether property owners should or should not be required to maintain or install curbs and sidewalks. In January 2017, at the recommendation of the Committee, Council instructed Borough staff and the Solicitor to develop a Curb and Sidewalk Installation Program to identify where curb and sidewalk networks are necessary Borough-wide and to determine whether the existing policy requiring those improvements to be installed when streets are scheduled for reconstruction should be changed. 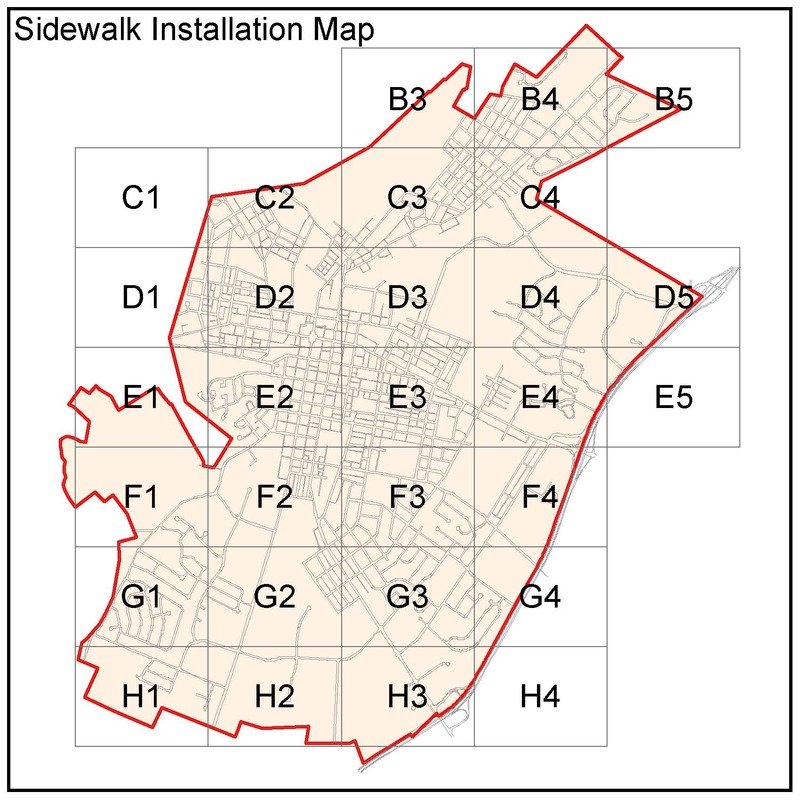 On October 19, 2017 the Committee reviewed a Curb and Sidewalk Installation Program, as prepared by Borough staff that includes a series of DRAFT maps depicting where curbs and sidewalks are currently located and where they may or may not be required in the future. Areas where curbs may be required are depicted based on storm sewer system needs. Areas where sidewalks may be required are depicted to make connections between existing sidewalk networks in areas that are already developed and those that are not. Pedestrian paths are depicted based on existing facilities like the Rail Trail or future facilities as recommended through the Official Map and draft Pedestrian and Bicycle Improvements Plan. 1. When should new curbs and sidewalks be required? For example, never, when streets are scheduled for reconstruction, only when new land development is approved, only when complaints are made. 2. Who should pay for new curbs and sidewalks? For example, property owners individually or collectively through an assessment district, Borough tax revenue only, Borough tax revenue with property liens to recapture cost through Borough loans or when property is sold, federal, state or private grants, Storm Sewer Utility revenue for curbs, a combination of these examples. 3. What revisions are necessary for the DRAFT maps? 4. If maps are approved, how would they affect property owners? How would the noted policy decisions apply? Would there be a process for property owners to appeal a curb and/or sidewalk requirement determination? To offer plenty of time for property owners, and the general public, to review and comment on the DRAFT maps and policy decisions, the Committee was asked to authorize release of this website and to schedule a series of public meetings in 2018. Comments received through the website and public meetings will be shared with the Committee sometime in 2018 so they can consider those comments before making any recommendations to Council about the DRAFT maps and policy decisions. The Committee meets quarterly in January, April, July and October so any recommendations to Council will likely be made in July or October 2018. Ultimately, it is up to Council to make final decisions regarding the Curb and Sidewalk Installation Program, including the DRAFT maps and policies. This website will serve as a resource for those who would like to participate in development of the Curb and Sidewalk Installation Program; to allow review and comment on the DRAFT maps and policy decisions, to announce public meeting and Committee meeting dates, times and locations and to provide any other information as the program is developed. Please contact Phil Wolgemuth, Assistant to the Borough Manager, at pwolgemuth@chambersburg or 717-261- 3232 with questions or comments about the Curb and Sidewalk Installation Program or if you need help navigating the DRAFT maps or website in general.